AFTA’s team is a collective of creative professionals who offer their time and talent to support the organizations relief efforts, arts programming and environmental platforms. At the forefront of each endeavor we aim to enable artist’s to create work, engage with their community and share the creative process. 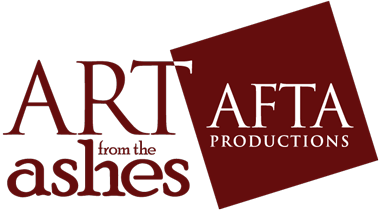 ART from the ashes (AFTA) is a 501 (c)(3) non-profit arts organization who champion art as an avenue to bring community together. Our creative vision is inspired by the transformative properties of art and its ability to connect people to their natural environment. With the belief that artist’s could provide a supportive avenue to their communities in the aftermath of wildfire, AFTA was founded in 2007 in Southern CA. In the spirit of its founding principles “Support. Inspire. Create. Renew.”, AFTA works with communities devastated by wildfire to initiate site specific arts programming that provides a cathartic avenue to support the community’s recovery. “There is nothing left.” Gutting words heard in the aftermath of natural disasters. Working with the creative community we connect to create something from “the nothing”, in quite the literal sense. Reclaimed materials from site specific locations serve as the catalyst for the creation of art. Twisted metal, glass, ash, wood, charcoal, hardware and found objects are transformed into one-of-a-kind works of art through each artist’s unique creative vision. They capture a story, these works chronicle a specific time, place and spirit of community. The art and creative process mirror the transformation the people and land undergo as they come together, rebuild and thrive. Since it’s inception, AFTA has orchestrated an extensive platform of arts programming including permanent and temporary public art, environmental installations, exhibitions and community engagement programming. As the connection to AFTA’s creative approach has evolved, AFTA Productions was introduced to produce and curate community and environmental arts initiatives in addition to ART from the ashes wildfire relief efforts.